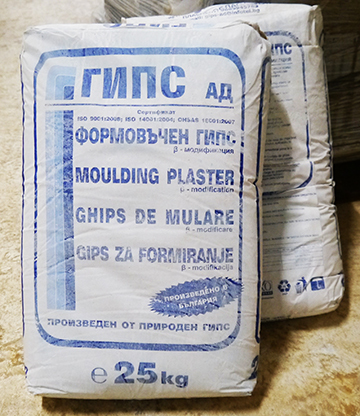 Molding gypsum: for the production of molds, models and products in the porcelain, ceramic and faience industry. This gypsum is used in the ceramic industry to produce working chambers for pottery, souvenir and sanitary ceramics, as well as for modeling. Bending strength - after 2 hours - 2.5N / mm2; after 7 days 4.6 N / mm2. Clamping strength - ice 2 hours - 5N / mm2; after 7 days 11N / mm2. We offer one of Saint Goben France's finest products to create high-quality mats for RAM presses where sustainability and porosity are of utmost importance. It is produced in Germany entirely from natural materials. The temperature of gypsum and water should be approximately the same - within 15-20oC. The gypsum is added slowly to the entire amount of water and is kept for about 2 minutes to take it. Stir with a mixer, depending on the amount of time the mixer turns and the amount of gypsum (6-12min). It is recommended to stir under vacuum. After mixing, the gypsum temperature must be measured. The matrix is ​​then poured. Its temperature is also measured. When it rises to 6-8 ° C, air is fed to release the pores. Initially, the pressure was 0.5 bar and increased every 30 seconds by 0.5 bar until a pressure of 5 bar was reached when it was held for 30 minutes until the matrix dried. Then wait no less than 12 hours to harden.